Acer Wireless Laptop Router is a simple to use software that turns your WiFi-enabled Acer laptop into a wireless router. You may come across the situation of temporarily needing an extra wireless router, but you have only Broadband Connection. To share the Internet connection, you can use your Acer Laptop as a wireless router (for your iPod Touch, another laptop, etc.). Turn your Acer WiFi laptop into a wireless router. ...... ). Acer Wireless Laptop Router drives your Acer laptop's wireless adapter to broadcast a WiFi signal just like a real wireless router but not that complicated. Just several clicks, you can own a handy wireless router anywhere. Please note that the Acer Wireless Laptop Router is for Acer laptops only. For other brand laptops, please refer to Lavians produts page. 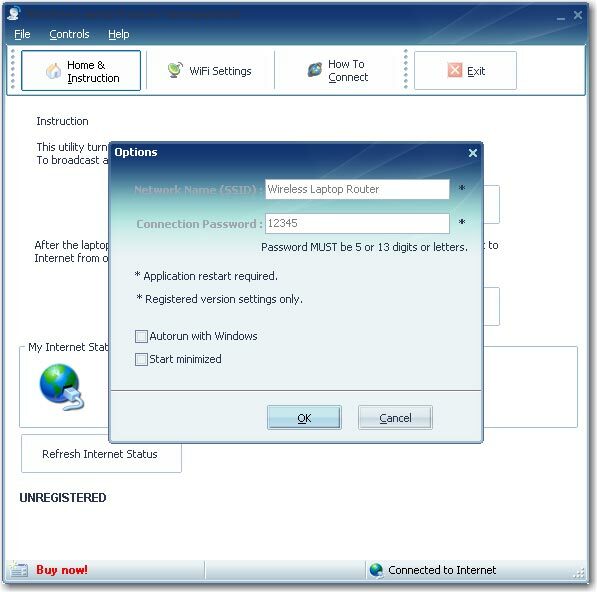 Qweas is providing links to Acer Wireless Laptop Router 2.5 as a courtesy, and makes no representations regarding Acer Wireless Laptop Router or any other applications or any information related thereto. Any questions, complaints or claims regarding this application Acer Wireless Laptop Router 2.5 must be directed to the appropriate software vendor. You may click the publisher link of Acer Wireless Laptop Router on the top of this page to get more details about the vendor.